*Note: To clarify, it appears the email in the Message Center only indicates if you’ve been invited to register, not whether your listings now go through Managed Payments. eBay rolled out the managed payments beta to its workforce in the summer, where thousands of employees participated in the program. 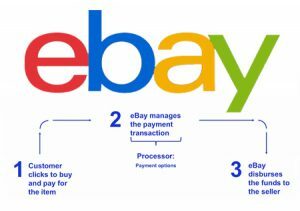 eBay CEO Devin Wenig tweeted yesterday that the company transacted its first fully managed customer payment on Monday, adding, “Over the coming weeks, thousands of sellers who opted in will be rolled into the Managed Payments program” – so sellers should continue to keep an eye on their messages. Earlier this year, we announced that eBay would manage the payments flow to simplify the end-to-end experience for customers. Today, we’re delivering on that commitment and have begun managing payments for the first wave of sellers. Sellers who have been invited to register will see an email in their Message Center. “In less than eight months since announcing our payments initiative, we’ve moved rapidly to build back-end payments and risk platforms, engage thoughtfully with our seller community to solicit their input on managed payments, and line up new forms of payment—all of which has led to today’s introduction of managed payments. Looking ahead to 2019, we’ll expand to include more U.S. customers before rolling out our new payments experience globally” said Steve Fisher, Senior Vice President of Global Payments at eBay. The goal of managed payments is to drive significant benefits and efficiencies for our hundreds of millions of global customers. In the new managed payments experience, sellers will benefit from one set of fees, more predictable access to their funds, and better visibility into sales and payouts. For buyers, we’ll be able to provide greater choice in payment options at checkout. Two months ago, we announced that Apple Pay would be among the first mobile forms of payment offered in our new payments experience. We will continue to expand managed payments to customers over time and expect to have transitioned a majority of our marketplace customers to the new payments experience in 2021. For more information on managed payments, visit Seller Center. We’ll continue to update you on timelines for seller registration. You can also read a recent Q&A from our VP of Global Payments, Alyssa Cutright. eBay has been partially censoring millions of sellers’ listings ever since its current search algorithm Cassini was introduced in 2012. It has been devastating to our livelihoods. Cassini (often referred to as “Can’t See Me”) is very sneaky. It gives one just enough sales to keep going with a paid subscription to list offerings on the site while preventing most new sales and new contacts with buyers via a very complex shadowbanning subroutine that has almost every seller fooled. Part of the purpose is to keep as many store subscriptions going as possible so as to maximize its corporate income. Another part of its purpose is to steer sales towards corporate sellers, Chinese sellers and socio-political allies. I saw sellers with 10-25 employees and millions in annual sales get totally wiped out immediately when Cassini went active. These were outfits that sold new products like office supplies efficiently in direct competition against corporations. In effect it has turned marketplace commerce on eBay into a socialist system that rewards only certain entities while severely repressing others. Mystified sellers refer to it as “rolling blackouts”, but it is actually a combination of showing one’s listings to new contacts in only one part of the world during a given time period and then shadowbanning that seller from all further sales that day to new contacts once the seller’s hidden “selling limit” has been reached. In my case with a so-called Premier Store it would show my offerings to new contacts in only one time zone per day, rotating globally on a daily basis like a disco ball, and once I had made one sale that day, I was then shadowbanned from any further visibility to new contacts that day. Since 2012 the only sales beyond one per day have been to watchers or repeat buyers. I noticed it because from late 2012 to late 2016 I would get one sale early in the day to a new customer, and then nothing. It was almost always early in the day. Before Cassini I would get 2-3 sales to new contacts almost every day. My gross monthly sales before Cassini were $2k-$3k and after Cassini was applied it steadily dropped to about $600/month. This is very similar in scale to what alt media has reported with their own incomes after being censored. On top of that, it seems that whenever the ‘disco ball’ was over the Pacific or Atlantic Ocean, I would get no sales at all for days. The geographic pattern of sales was telling: one would get a few sales from Europe, then a few blank days followed by a few sales to USA, then a bunch more blank days followed by a few sales to Asia/Australia, and so forth on a rotating global basis. Some other sellers posting comments on ecommercebytes.com noticed this pattern but did not figure it out. 1/24 x ~1/3 = ~1.4% visibility. There you have it. I am sure it varies from seller to seller. For example, sellers with an Anchor Store most likely get more sales per day to new contacts before shadowbanning than I do with a Premier Store. And they are more easily fooled because they have more repeat buyers than someone like me with a smaller store does. As another example, in early 2017 I tried a small Basic Store for a while and got one sale per week, then shadowbanned to new contacts for the rest of the week. I’d get one sale early in the week and then nothing for the rest of the week. Hence I had to limit what I offer to only better, costlier items so that my one sale per time period would bring in the most money possible. This is why my sales only went down about 60-70% as opposed to 95%+ for alt media sites which do not have that product flexibility. Since I began to support Trump online in Oct. 2016, eBay has gone absolutely nuts with the shadowbanning and has got me down to about $300/month on average. It is quite obvious to me at this point that eBay is applying a hidden Social Credit Score as part and parcel of Cassini to help accomplish this with. This complex shadowbanning operation Cassini being run by eBay needs to be exposed and publicized. All we ever hear about is how media and political sites are being censored, but it is going on in e-commerce, and has been, to a much greater extent and for much longer than it has been with the media. A similar thing is now happening on Etsy. Established successful sellers have seen their sales cut by upto 75% by this on/off technique. This has been widely discussed on the forums and dismissed by the Etsy cupcakes as “conspiracy theories”. In the meantime the sellers whose shops are filled with fake vintage and handmade (purchased on AliExpress) and copywrite infringed goods go from strength to strength because they are raking in thousands of dollars a month for this sleazy company.